There's no doubt about it - Joss Whedon (The Avengers) is a fan of Star Wars. All it would take is about ten minutes of watching Firefly to come to that conclusion. But that doesn't mean that the writer-director doesn't have any issues with the franchise. Case in point: Whedon recently revealed that he's not much of a fan of the ending of The Empire Strikes Back, particularly its unresolved nature. In fact, his exact words were: "It was a terrible idea." "[Empire Strikes Back] committed the cardinal sin of not actually ending. Which at the time I was appalled by and I still think it was a terrible idea." The interviewer was a tad surprised by this, so he asked Whedon if he really thought that Empire had a bad ending. "Well, it’s not an ending. It’s a Come Back Next Week, or in three years. And that upsets me. I go to movies expecting to have a whole experience. If I want a movie that doesn’t end I’ll go to a French movie. That’s a betrayal of trust to me. A movie has to be complete within itself, it can’t just build off the first one or play variations." Everybody's seen The Empire Strikes Back, right? 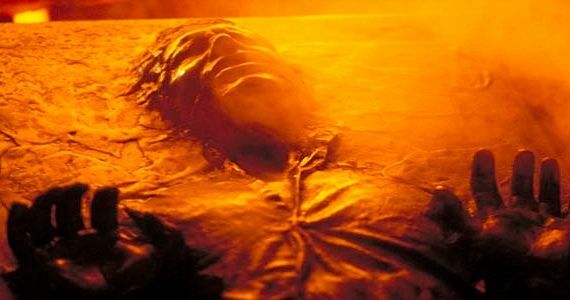 We all know that near the end of the movie, Han Solo is frozen in carbonite and taken by the bounty hunter Boba Fett to be sold to Jabba the Hutt; we all know that Luke Skywalker gets his hand lightsabered off by Darth Vader, who claims to be his father, Anakin Skywalker. It's such a fixture of pop culture that even people who've never seen the film know what happens. While Whedon is certainly free to feel however he wants to about Empire, it could be argued that the film IS a complete experience. Many of the character arcs started in the film are concluded, more or less, by the end - they're just not feel-good conclusions. No, you don't know precisely what becomes of Han Solo, but that's as a result of the mistakes he made in the story. Against Leia's wishes, he took the crew to Cloud City and he paid the price for doing so; off to Jabba's Palace he goes! Likewise, Luke left his training way too early - against Yoda's wishes - and Vader wiped the floor with him, emotionally, mentally, physically, and otherwise. Maybe if Luke had stuck around for more Force training, he would've been more capable of withstanding any paternal revelations. That's why there's a cliffhanger. It's not just there because the producers are saying "See you next movie, everybody!" It's also there because of the mistakes these guys made as characters. Their actions had unsatisfying and semi-inconclusive consequences. They lost because they screwed up. Now, there will undoubtedly be people who say, "But Joss, what about individual TV episodes with cliffhangers? You've made so many of those!" In fairness, Whedon is differentiating here between a film experience and an episodic experience (never mind that the Star Wars movies have long been considered episodic, and they're steeped in the stylistics of the movie serials of yore). However, a better example would be a cliffhanger to the end of a series. Has Joss Whedon ever produced a major cliffhanger for one of his TV shows that left a lot of things unresolved? Yes. Perhaps one of the more notorious examples of unresolved series finales is Whedon's Angel, which saw Angel and his crew running headlong into battle against the Senior Partners' massive army (made up of all manner of monsters, including a dragon). Before we can find out what happens to them, the credits roll. Is this a good analogy for Empire's ending? I would argue that it is, though some might say that it's more akin to Butch Cassidy and the Sundance Kid, which rather famously didn't depict the fate of its two protagonists against an army of Bolivian soldiers. However, I would counter that the difference between these two "endings" is that we absolutely know what happened to Butch and Sundance - they died. Straight up. There's no doubt about it. They did not hold their own against an entire army because they are not supernatural creatures of the night magically imbued with souls. As for Angel and his friends, we have no idea what happened to them (unless we've read the comic book continuation). Did they win their fight against the Senior Partners? Were lives lost in the process? We'll never know because it never played out onscreen. 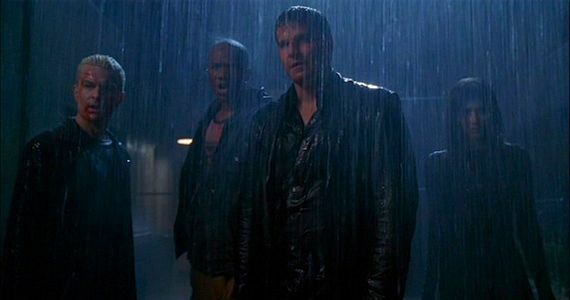 Much like Empire, the ending to Angel left some major life and death questions to be answered, and yet it was still an incredibly satisfying and bittersweet experience for fans. Unlike Empire, we never got answers to those questions, because Angel was canceled by The WB. What say you, Screen Ranters? 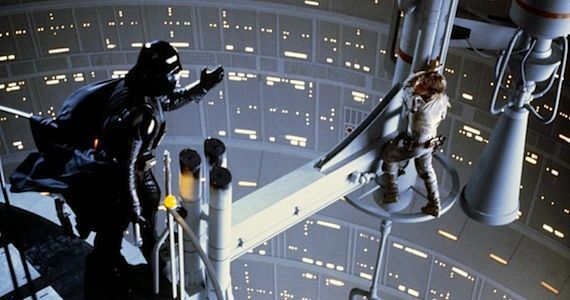 Do you agree with Joss that The Empire Strikes Back doesn't really have an ending? Drop us a line in the comments. Joss Whedon's next movie, The Avengers: Age of Ultron hits theaters May 1st, 2015. Star Wars: Episode VII is rumored to be scheduled for a December 2015 release.